ReactJs helps you to create an interactive user interface easily. No matter how complicated the data is, you can create interactive charts and UI elements elegantly with the ReactJs. Since it is created and maintained by the Facebook and Instagram community, you needn’t worry about the quality or the how well it manages the complex codes. Thus React is the best source to create an interface for web applications and the react dashboards have more advanced user interfaces. The major advantage of the ReactJs is, the components can be easily rendered and viewed, it ensures readability and makes maintainability easier. For developers, it easy to test, even form the server side it can be tested. The only downside of the ReactJS is, it is just a view lawyer. It means you can use it to create an interface, but it cannot be used for maintaining the data. To handle the data you have to combine the React with other MVC’s (Model-View-Controller) frameworks. 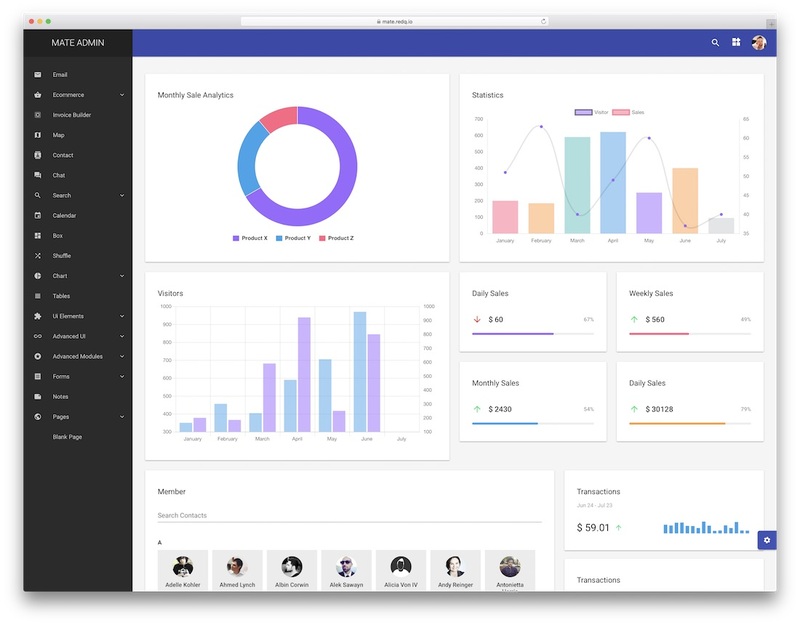 Now you might get an idea that these best react dashboard template can’t be used by the general users directly, as you do with the WordPress themes. 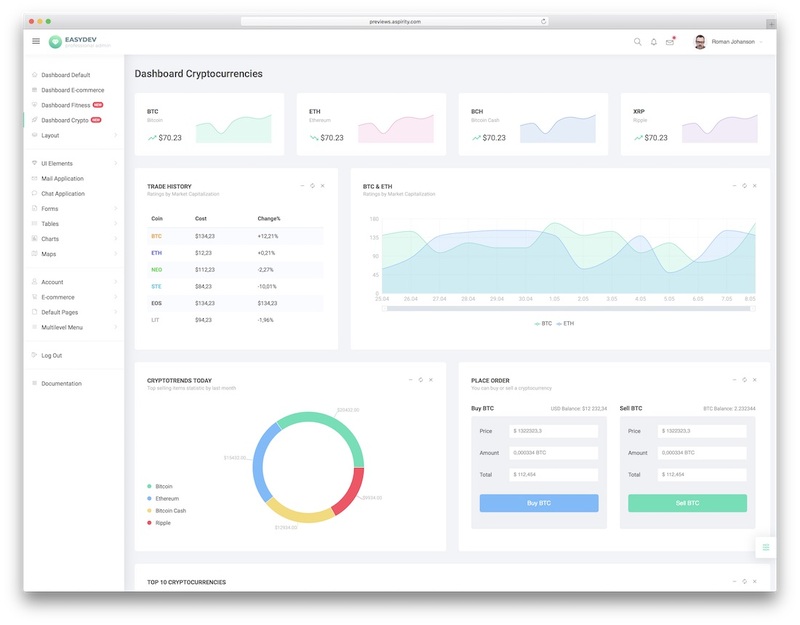 You can use these react dashboard templates as a base and can create your own web application and dashboards for your site. Saying that, let get into the list of best React dashboard templates. EasyDev is a clean, modern and user-friendly React dashboard template with some truly impressive features and assets. It incorporates all the latest technology trends to make a tool that will benefit you tremendously. With the clean code and in-depth documentation, everyone can set up an admin dashboard for their application. For your information, EasyDev works with both web and mobile applications and quickly adapts to your needs. In the solid kit of goodies, you will find over two hundred UI elements which you can use however you want. Moreover, EasyDev comes with both a dark and a light layout and a total of over one hundred pages. A ton of charts, forms with validation, eCommerce pages, creative calendar and valuable table sets, EasyDev brings it all to the table. All you need to do is to utilize the available and have the end product ready to go live quickly. With a name like that, you know the web design is neat and straightforward. That is exactly what Clean UI React dashboard template delivers. What’s more, Clean UI is a two-in-one template that includes both admin section and landing page. Combine the two and you can have something fresh complete in little to no time. Make sure you use Clean UI to its full potential and you can experience some truly fantastic results for your project. In the Clean UI bundle, you will find eight predefined demos, loads of buttons, icons, charts, pages and add-ons. Clean UI is also simple to modify what makes it very beginner-friendly. You will have a blast editing and improving the look and style of Clean UI and make it follow your needs with ease. There is no need for you to develop an admin from the ground up, you have it all at your fingertips so make good use of it. As its name implies, Fuse React is a React Redux dashboard template that is based on Google’s popular Material Design. You will not need to look elsewhere once you download Fuse React. It comes with multiple predesigned layouts and entire admin solution for you to hammer out something professional and high performing super fast. The advanced theme management allows you to change the looks with a single click. Fuse React contains over five different dashboard styles, loads of different color schemes and offers to choose from vertical or horizontal navigation. Many reusable components, invoices, a coming soon page and contacts, give Fuse React a look and be impressed. On top of that, the template is also fully responsive and cross-browser compatible what gives it stability and stunning appearance across all devices and platforms. Reactify gives you all that you require when it comes to building the perfect admin for your online project. 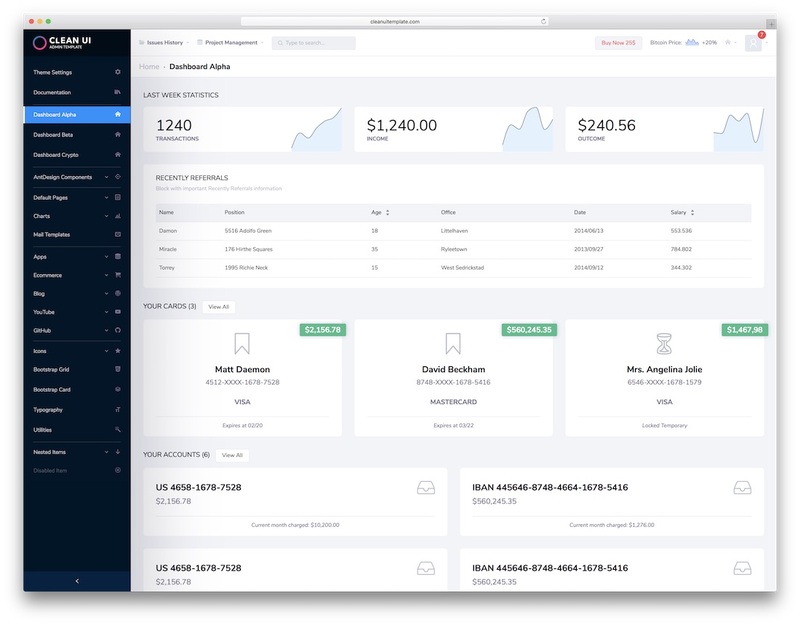 It is a top-notch React dashboard template that sorts you out with an eCommerce and a SaaS solution out of the box. Of course, you can use it for other intentions, too, since Reactify readjusts to the desired project in a breeze. Besides, it is also entirely customizable and gives you complete permission to tweak it however you fancy. A mad assortment of features amazes every Reactify user. From over 65 widgets and multilingual support to horizontal menu, twenty charts and advanced reports, Reactify is a fully loaded tool. Individualize the web design of Reactify with icons and text editor and enrich it with your personal touch. You can achieve a remarkable outcome only by utilizing all the ready-to-use content. 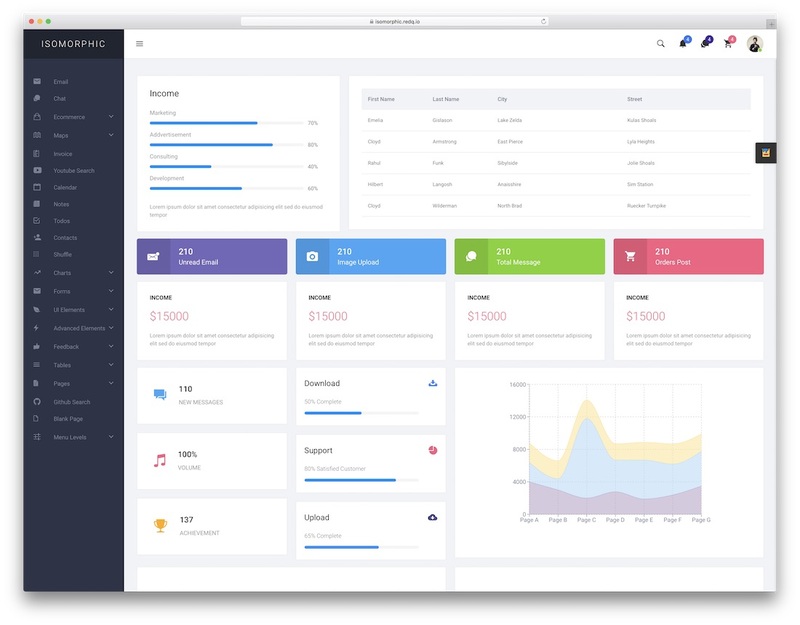 Mate is a modern, organized and clean React dashboard template for all your business and project needs. No matter the application you are about to bring into being, Mate is here to do you well. It is a superb tool for creating a features-packed admin that will cover all segments of your business. You only need to download the tool, invest a small amount of time and effort and you are pretty much ready to go live. Yes, it is that ridiculously simple. Due to the implementation of all the latest and greatest web and tech practices, Mate provides an always stable and comfortable experience. It is 100% mobile-ready to work smoothly on all devices, from mobile phones to tablets and all the way up to desktops. 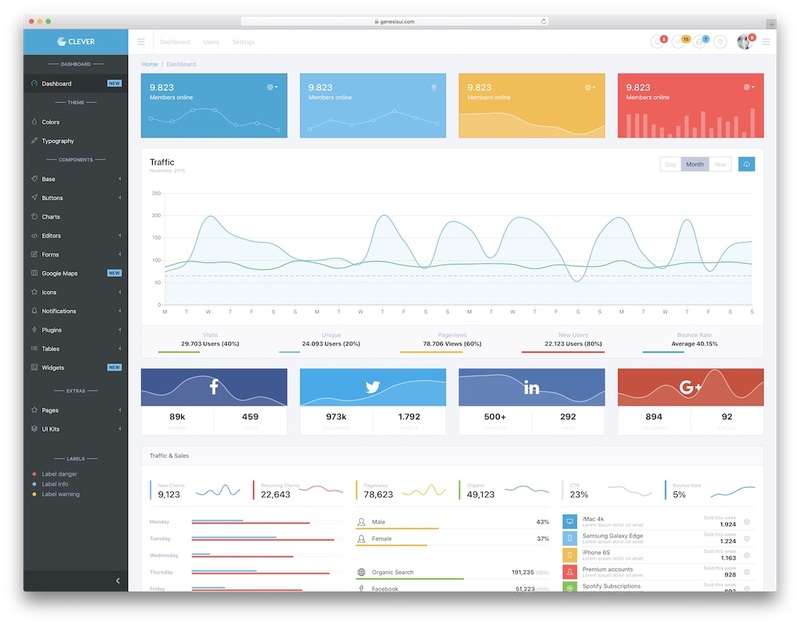 Make yourself the exact dashboard you need and successfully run your web or mobile project with a stable growth. Portal is a pack full of traits for establishing admin dashboards of the highest standards. There are plenty of options you can choose from with even more possibilities that boost the potential to some truly extreme levels. Portal comes with six stunning layouts that will help you select the ideal look for you application admin. Now is the right time to take action and make good use of Portal and all its features and assets. Multiple layouts, unlimited color options, Material Design guidelines and a flexible design are some of the characteristics you are treated to with Portal. Lazy loading, charts, error pages and a tidy code are just some of the additional traits of Portal. The template is also fully RTL ready and comes with a lifetime of free updates. Your admin will always be up to date and never grow old rather look refreshing at all times. 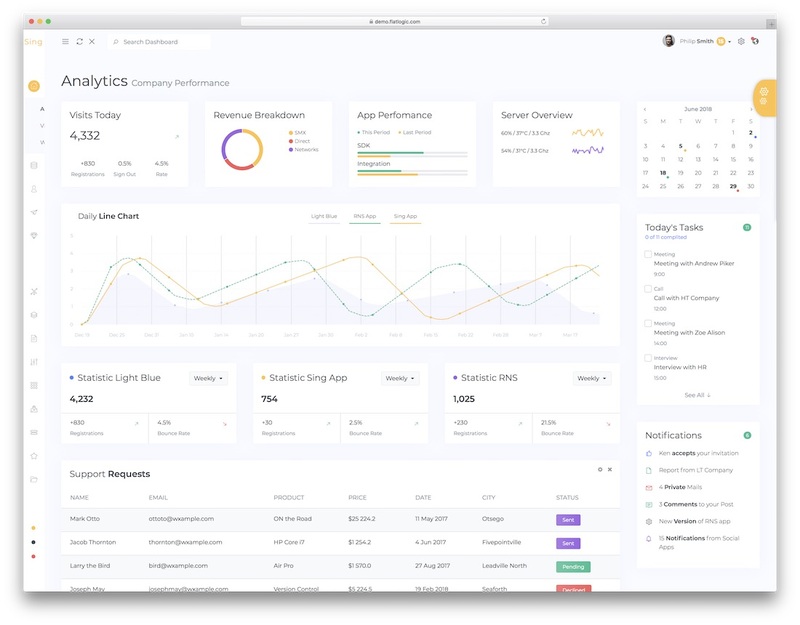 Jumbo React has a name like that for one simple reason: it is a grand React dashboard template. You get two versions in the package, the Material and the Flat one. Pick what suits you best and start building your ideal admin straight away. You can realize your application super fast since the majority of work has been done already. The layouts, the widgets and the extensions, they are all ready-to-use for your convenience. Six different layouts, dark version, four dashboard styles and four pre-built apps, you surely will appreciate all and everything that Jumbo React has to offer. And that is a lot. Speaking of which, Jumbo React comes with practical alerts, charts, editors, many extra pages, drag and drop list ordering and many more valuable web elements. There is also full documentation available online and access to quick support for when you need any extra guidance when building the necessitated admin. You can mold and form all bunch of different admins for a variety of apps with Mouldifi React dashboard template. This is a truly clean and impressive admin canvas for building both small and complex applications. Regardless of what your business is, Mouldifi will not have any issues adapting to it. In fact, for the most part, Mouldifi is ready for your project out of the box. However, feel free to customize and adjust the web design to your requirements for a unique appearance. Mouldifi comes in two gorgeous looks, flat and dark. The template also has four built-in apps for a Todo, Email, Chat and Contacts sections. Moreover, three different styles of navigations, dynamic routing support, Google Maps and many cracking extensions are all the assets you get. Have a solid start with Mouldifi and never look back. 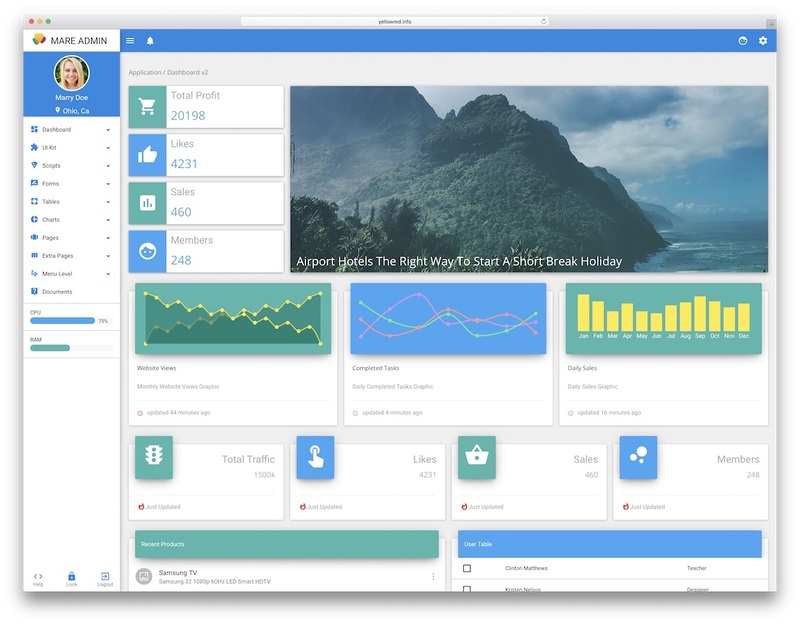 Isomorphic is the best React dashboard template you can get on the market now. 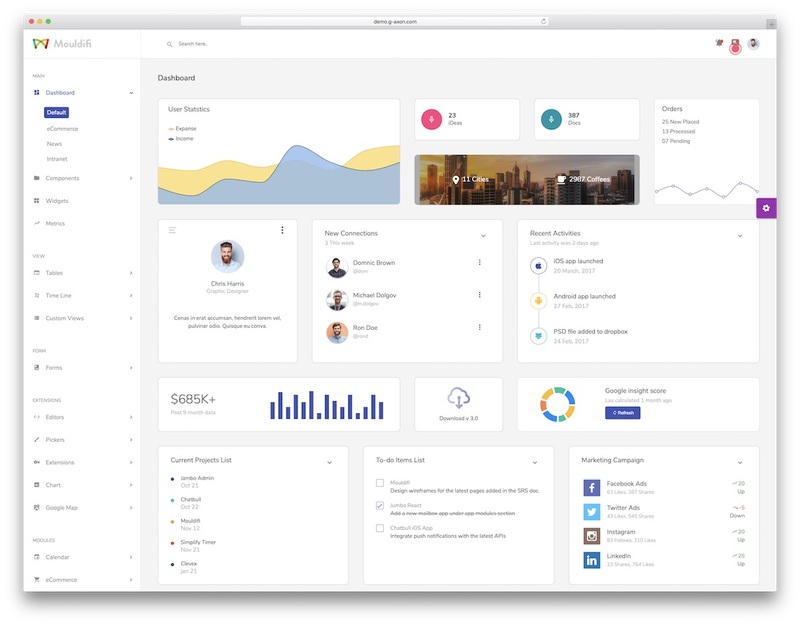 It is a super clean website dashboard with flat design and flat colors. Most of the people won’t able to use it straight away because to install itself you have to mess with some basic structures like Yarn for secure dependency management and of course Node Js. They gave a complete documentation on how to use it and how to mess around with it. Ok, that’s for the developers, form the user point of view you get clean segments with neat colors and complete control. You can almost change each and every element of the template. Being the sole purpose of ReactJS is to make an elegant user interface, this template helps you to develop one of such elegant interface easily. There is plenty of elements are given in this template, you can pick only the elements you need. 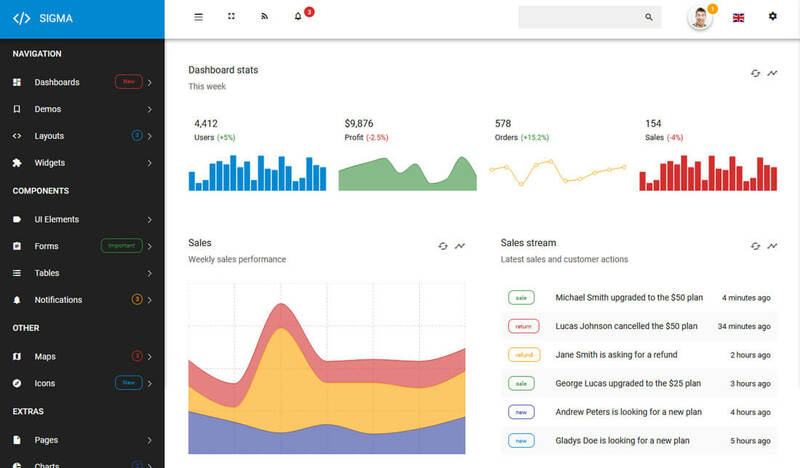 Material Design react admin is a clean looking flat style dashboard design. 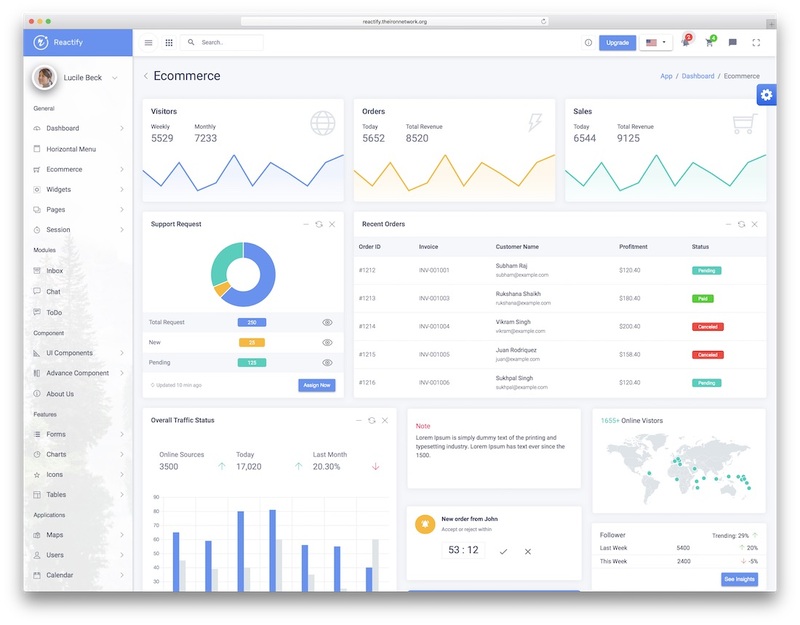 If you are into material design website templates a lot, then this template will help you create the dashboard that meets the overall design mood. This template uses material icons to smartly indicate the fields and options. With this template, you get UI Kit with all the basic web elements and you get other features like charts, forms, tables and e-commerce elements. 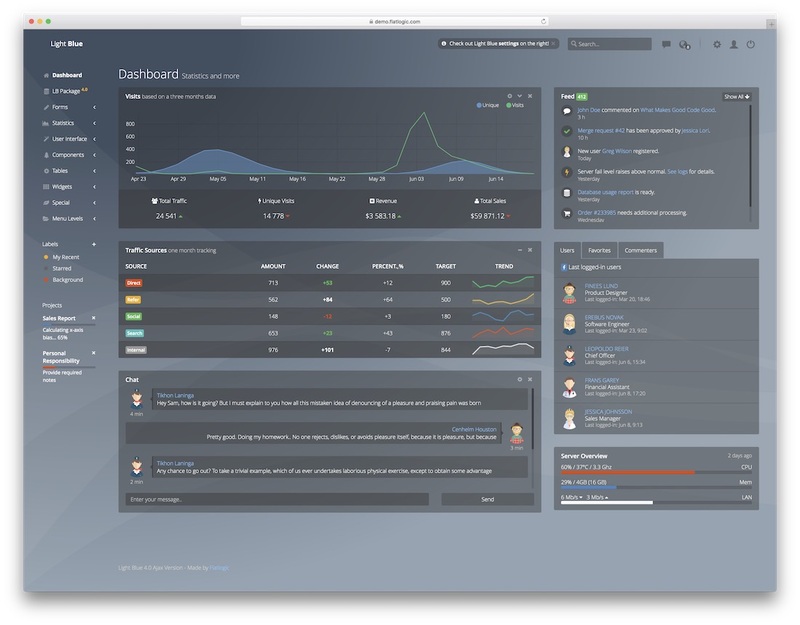 It is a flexible template which also allows you to change the skin of the dashboard. This well coded template uses HTML5, CSS3 and Bootstrap 4 framework. The Analog material design is a feature packed dashboard template which will come handy for many of your web development works. 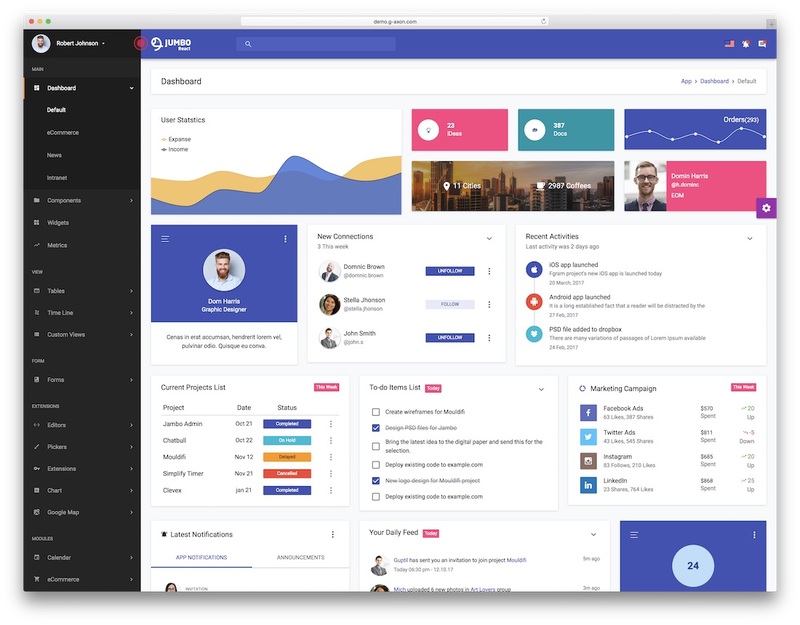 This template not only gives you React dashboard templates, they also provide you AngularJS templates. Along with the dashboard template, you also get agency website templates with this package. You get 12 color variations for the dashboard templates. The designer had decided to keep it simple and professional looking, it does not include any flashy elements in the dashboard. With this template, you get elements like e-commerce, 15+ UI elements, forms, tables, and charts. This template uses HTML, React, Angular, Bootstrap, and Redux frameworks, so it is a complete package helps you develop any projects from scratch. 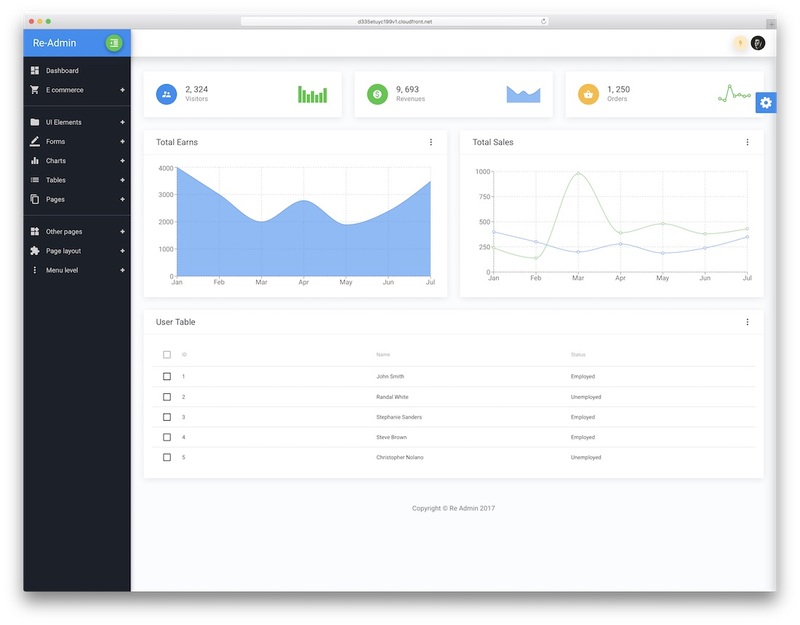 Sigma is a react and redux based website admin dashboard template. The specialty of this template is, it is completely developed with the React framework and the jQuerry is used. So if you are searching for a raw template that is well coded for your project, then this template is worth giving a try. Like the Eract this template also provides widget options. 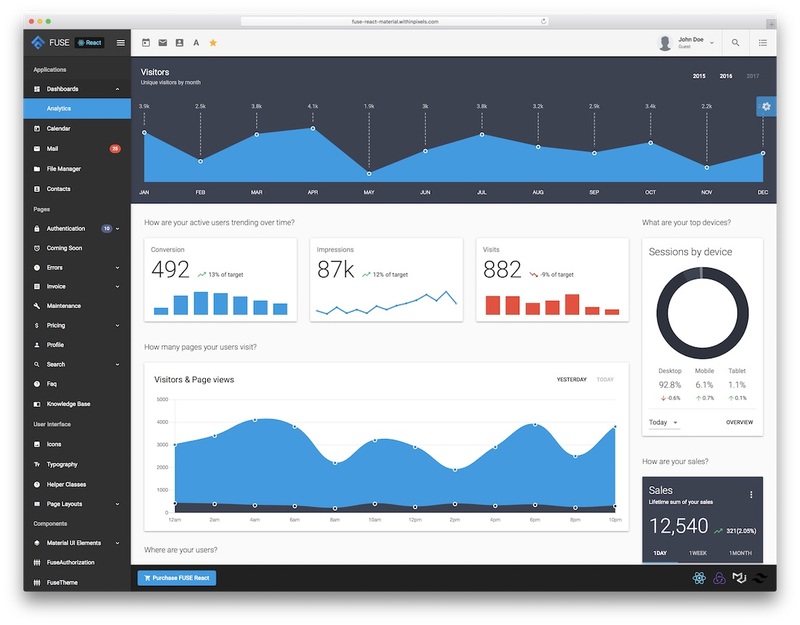 Sigma gives you a straightforward dashboard with the usual graphs and rounded buttons.Other than that you get timeline based user activity on the site. The Sigma uses flat custom icons and labels to indicate the number of notifications like you get in most of the mobile app now. The sidebar with the navigation is flexible, you can expand and collapse within a click. If you are managing many members of your team and have to show them their individual performance elegantly in their dashboard, then Mare Admin is the template for you. It has the elements and features in the dashboard that a user has to know about their performance. It is clean and professional looking and the stats are shown neatly, that the user won’t feel annoying. This react dashboard template also uses an indicative type UI for the notifications, like in the Eract template. With one click the right sidebar navigation can be collapsed and expanded easily. This template gives you lots of dashboard components to use like forms, tables, charts and menu level. It is a fully responsive dashboard template, so this can be seen clearly even in the small screen devices. This template uses React, Material UI and HTML frameworks. Angle is another well-coded feature rich dashboard template, which the developers love to use. Just like the Rubix template, this dashboard template also supports more than one framework. Where it differs from other templates is it gives you template demo for each framework it uses. So it helps you can understand better the output of each framework. Design wise the template looks clean and simple with material colors. In the react dashboard template demo, you have three dashboard demo variations. All three concentrates mostly on the charts and stats. If you trying to make a dashboard for an SEO related web admins, the default design of this template gives you a better reference. This template is mobile responsive and also supports lazy loading to manage the tasks effectively. As a package, you get dashboard template for the popular frameworks like AngularJs, Ruby on rails, MeanJS, ReactJs, Meteor and Net core. 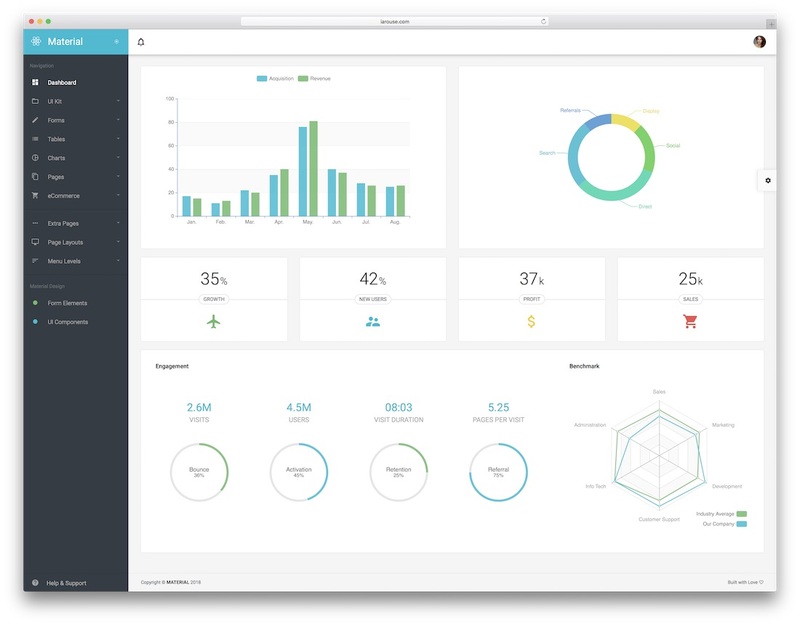 Simpliq is a corporate style dashboard with all the detail on the dashboard. The admin can have an overview of all the fields he/she handles in the dashboard itself. The smart design of the dashboard helps you to add more elements to the dashboard without overcrowding the screen space. This template does not give you animation effects on the dashboard, it is simple and clean. 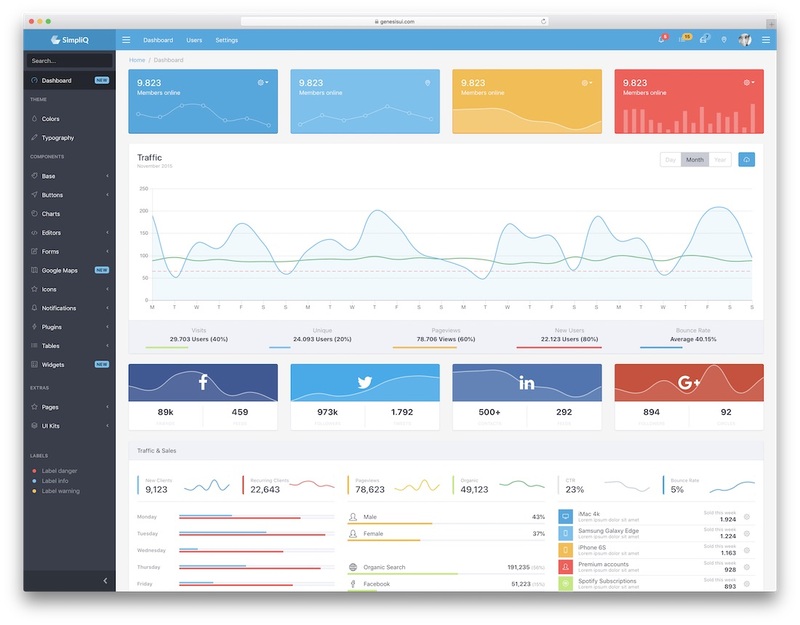 Like the previous dashboard template, Simpliq is also a multiple platform supported dashboard. This dashboard is developed on all the popular framework, to give users the freedom of selecting the framework they prefer. The major collection of the template is built based on the Bootstrap 4 framework, but if you need Bootstrap 3 version is also available. This template is available in the frameworks like HTML, Ajax, Angular, ReactJs, and VueJS. 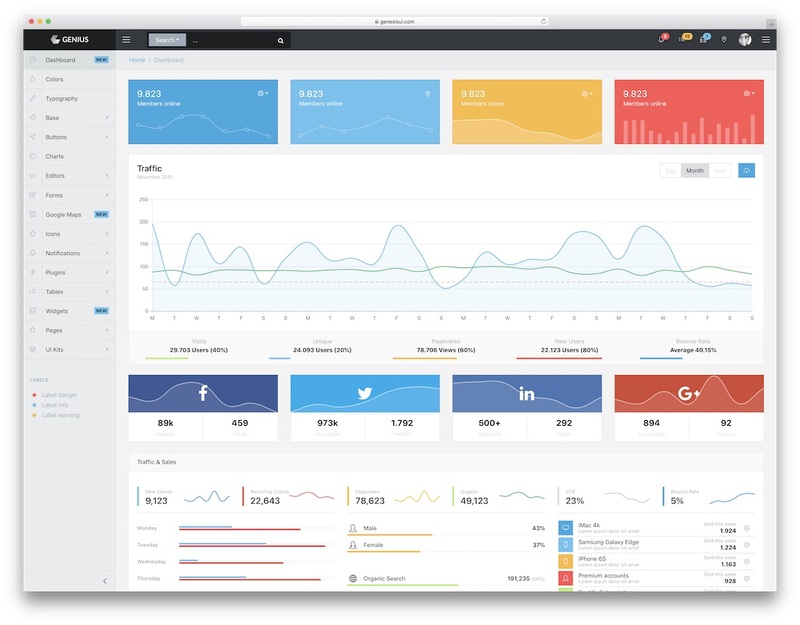 Genius is another multiple platform supported dashboard template. With this package, you get a dashboard for multiple popular frameworks like HTML, AJAX, ReactJs, AngularJs and Angular 5. This template is also from the manufactures of the Simpliq dashboard template. You get the same design standard and best quality you get in this template as you get in the Simpliq. Where you can find the difference is the navigation bar and the options you get on the dashboard. Like the Simpliq, this template is also available in both the Bootstrap 4 and Bootstrap 3 versions, you can opt the one you like. 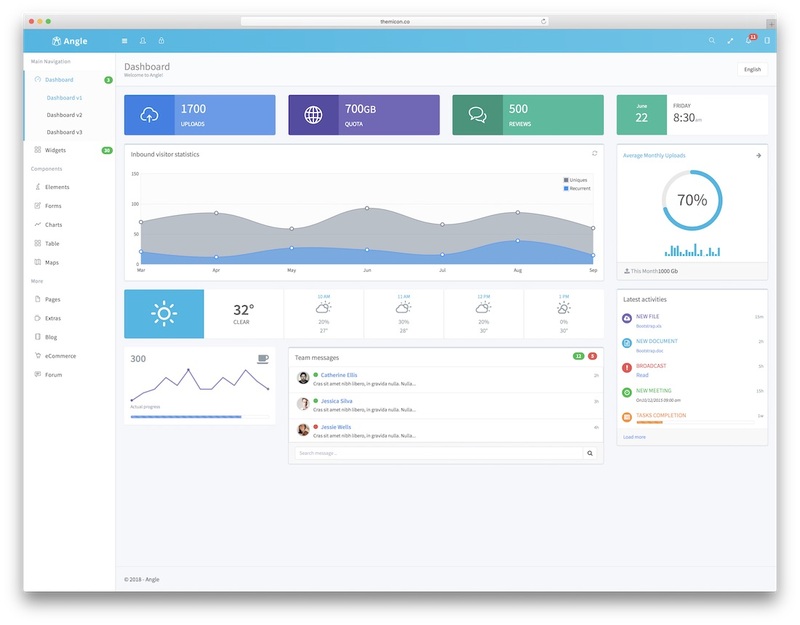 The Light Blue dashboard is a glassy looking interface style dashboard template. This template is super clean and simple, which makes this dashboard template an easy fit for any type of website or the web app you are preparing. Each segment in the dashboard are arranged like widget, so it will be easy for you to arrange and customize. This dashboard template comes in popular frameworks like ReactJs, VueJs, HTML and AngularJs versions. Easy one click settings options are given, to change the location of the sidebar and to hide the sidebar. This template also provides you three color schemes to choose from transparent dark, transparent light and white opaque. With this template, you get components like forms, charts, UI elements, and tables. Clever is an intuitively designed dashboard for online professional, who like to keep tabs on the multiple tasks at the same time. If you are a media person who looks after your brand performance in different channels, then this template will help you achieve what you think and also improves your workflow. With this template, you get components like UI elements, forms, charts, and maps. Widget options are also provided so that the user can customize their dashboard by themselves. To help you develop your projects easily, the author has shared the icons they used in this template. This multi-platform template supports famous frameworks like HTML, AJAX, ReactJs, AngularJs and Angular 5. How Your Admin Panel Looks? 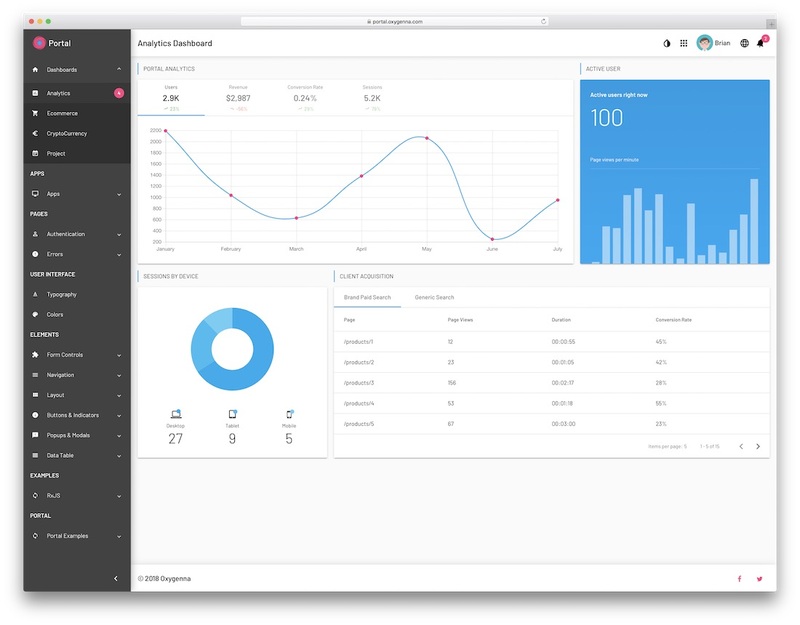 These are some of the best react dashboard templates you can buy on the market right now. All of these templates are built on latest React framework, to give you better option we have also added some multi-platform supported dashboard. All of these are a raw application, which you can use as a base for your projects, you can’t directly download and use them in your HTML website templates or WordPress themes. We have also listed some free dashboard templates to stay economic and to develop a better web application you can take a look at our free collection.